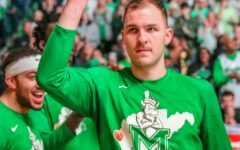 Marshall, WVU to face off Sunday for the first time in three years. 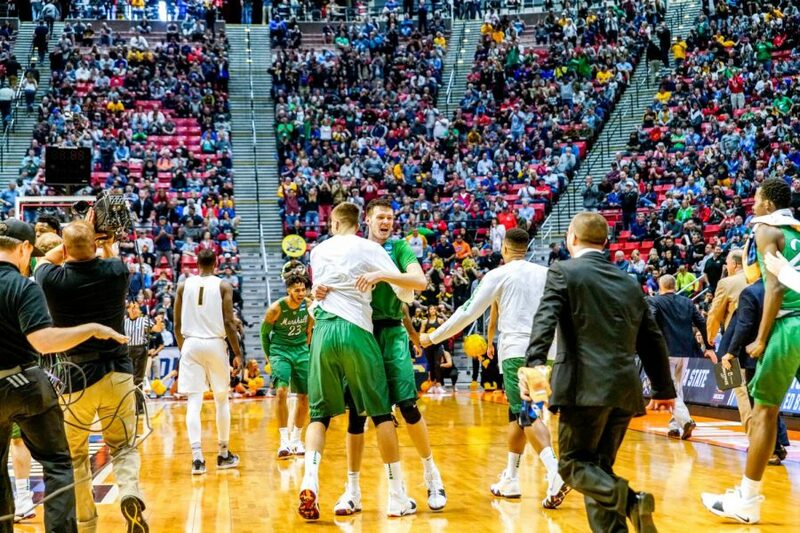 Junior forward Ajdin Penava and redshirt freshman guard Jannson Williams hug in celebration as the game clock winds down for a Marshall win. 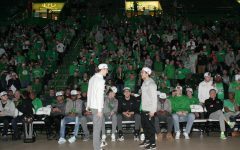 SAN DIEGO — Kelly green invaded Viejas Arena Friday morning at San Diego State University, as the Marshall men’s basketball team made history and downed Wichita State 81-75, to win its first-ever NCAA Tournament contest. 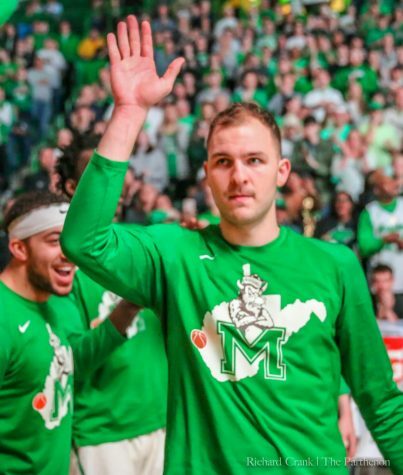 Marshall, the 13 seed in the East region, extended its winning streak to five games and ended the Shockers’ five-year streak of winning at least one game in the NCAA Tournament. 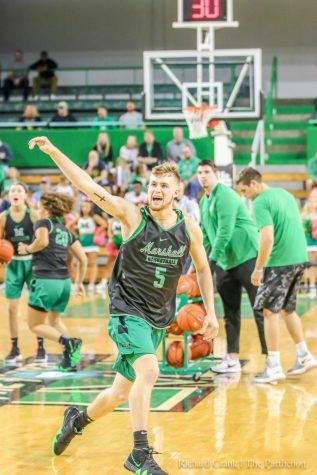 For the third-straight game, Marshall junior guard Jon Elmore led the Herd in scoring with 27 points. Elmore’s output was tied with Wichita State’s Conner Frankamp for the game-high. Elmore was the only game’s player to compete for the full 40 minutes. He shot 6-for-13 from the field, 4-for-8 from beyond the arc and 11-for-15 from the free throw line. The Conference USA Tournament MVP also tallied four rebounds, four assists and two steals. 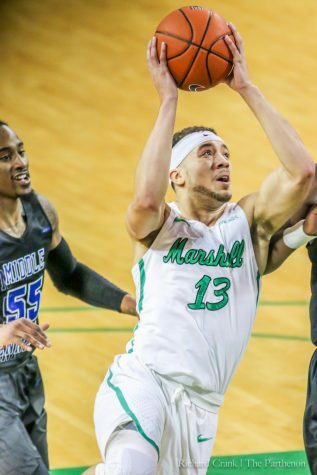 In Marshall’s four postseason matchups thus far (including three C-USA Tournament games), Elmore has combined for 95 total points, 30 assists, 20 rebounds and four steals. 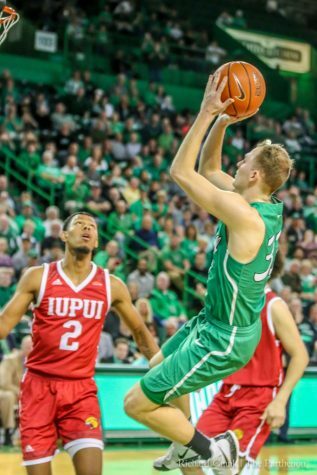 Four of the Herd’s five starters reached double-digit scoring. Junior forward Ajdin Penava scored 16 points, blocked three shots and retrieved eight rebounds, while junior guard C.J. Burks scored 13 and redshirt freshman forward Jannson Williams added 10. Williams accomplished double-digit scoring in four of his last five games, combining for 63 total points. 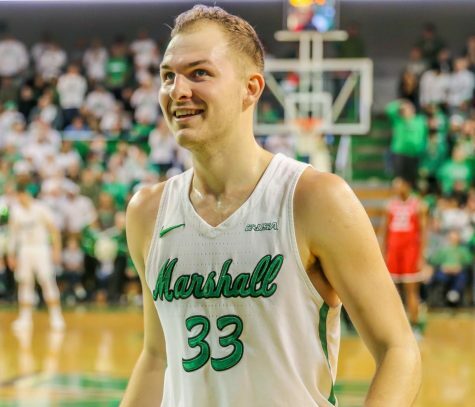 West, Marshall’s only starter without double-digit scoring, tallied nine points, four rebounds, four steals and two assists. 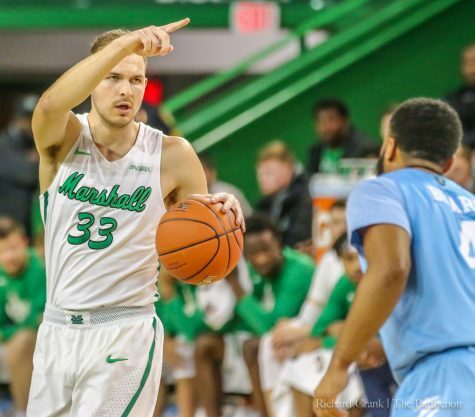 The Herd’s starting five accounted for 75 of its 81 total points, as junior guard Rondale Watson and freshman guard Darius George were Marshall’s only bench players to see in-game action. Both teams entered the game ranked top-20 in the nation in scoring offense (Marshall 11th at more than 84 points per game, Wichita State 18th at 83 points per game) and Wichita State’s starting center Shaquille Morris posed a threat inside the paint for the Herd. 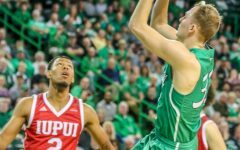 The 6-foot-8, 279-pound senior scored 12 points and grabbed eight rebounds in his 25 minutes of play. Marshall’s defense, however, offset Morris by forcing 15 Shocker turnovers (two by Morris) on 12 steals. 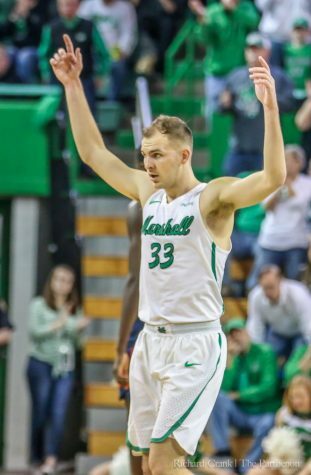 Despite being out-rebounded 44-30, Marshall outscored Wichita State 27-7 in points off turnovers and from the line, 16-13. 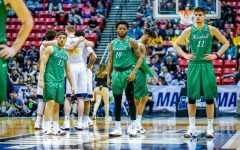 The Herd advances to the round of 32, played Sunday at Viejas Arena, as it matches up against its in-state rival—the Mountaineers of West Virginia University—for the first time since 2015. Last time the teams met, the No. 8 Mountaineers bested the Herd 86-68. WVU sat at No. 15 in the AP poll at the end of the regular season. The Herd, though, won against a No. 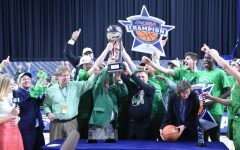 24 Middle Tennessee team less than two weeks ago (March 3).